Fred VanVleet (left) and Ron Baker (center), shown here during a Dec. 14 game, scored 15 and 16 points respectively to help the Shockers beat Indiana State on Saturday. 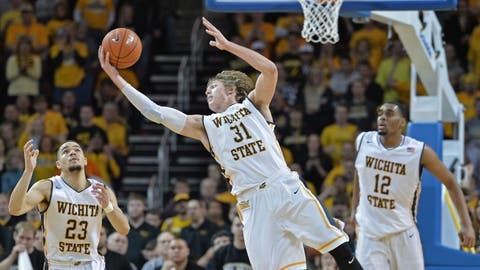 WICHITA, Kan. — Midway through the second half Wichita State guard Ron Baker senses the expected battle for first place in the Missouri Valley Conference was not going to happen. As the fifth-ranked Shockers kept adding to their lead and Indiana State appeared to become more frustrated, the eventual 68-48 blowout seemed inevitable. "When we held them to like four points in the first eight minutes after halftime, I could tell we were putting salt in their wound," Baker said. "It was pretty smooth sailing from there." Indeed, the undefeated Shockers (19-0, 6-0 MVC) cruised behind Baker’s 16 points and 15 from Fred VanVleet. Darius Carter and Chadrack Lufile each scored 10 points inside as Wichita State extended school records for winning streak and best start to a season. Dawon Cummings scored 19 points for Indiana State (14-4, 5-1). He was 7 of 14 from the field and the rest of the team was 9 of 37 (24.3 percent). "I thought we were ready," Indiana State coach Greg Lansing said. "We were loose, maybe too loose. We know they’re good. They could run the table and win a national championship. They are that good. But you have to rise to their level." That didn’t happen, mainly due to Wichita State’s defense. The Sycamores entered the game leading the Missouri Valley at 76.7 points a game, but they were just 8 of 24 from the field in the first half for 22 points. Led by VanVleet’s nine first-half points, Wichita State led 31-22 at halftime. "We had good defensive intensity in the first half," VanVleet said. "But we wanted to even take it to another level." VanVleet was the key to the start of the second half, driving for a left-handed layup and another point-blank jumper while being fouled. The three-point play gave Wichita State 36-22 lead with 17:16 to play. Things got worse from there for the Sycamores. They missed their first 10 shots of the second half and committed six turnovers in the process. "I’m very disappointed in how we let our missed shots and turnovers affect our defense and everything else," Lansing said. "It was almost like our guys knew they were beat and tried to get it over. If you’re a competitor, that can’t happen." Wichita State kept adding to its lead all the while. Cleanthony Early scored four straight points, and Carter converted a finger roll before making a running hook that made it 47-24 with 12:32 remaining. Indiana State finally made a shot 15 seconds later — allowing the sold-out crowd to sit and stop clapping continuously — when Justin Gant followed a Sycamores miss with a layup. The Shockers’ lead grew to as many as 28 — 61-33 — on a 3 by Baker with 8:47 left. "That’s a good team, a veteran team," Wichita State coach Gregg Marshall said. "To beat them by 20, you’ve done something." Wichita State outrebounded Indiana State 44-30. The Shockers were 3 of 15 from the 3-point line but 21 of 41 inside it. "To beat the No. 2 team in the league like that, it’s a statement in itself," Baker said. "But we’re the kind of team that’s going to worry about the next game and getting better anyway." At 19-0, Wichita State tied the 1962-63 Cincinnati team for second-best start for a Missouri Valley team. Both trail Indiana State in 1978-79, which did not lose until the national championship game.